250 gr de ternera Black Angus con mezclum de lechugas,tomate y cebolla crujiente, acompañado de dorados aros de cebolla en un brioche rústico/ 250gr of the best Black Angus beef,with crispy onion lettuce mix and tomato, served with golden Brown onios rings in a rústico bun. Despite making a reservation, and having that reservation confirmed by email, we arrived at the restaurant and were told that the kitchen had closed and they could not serve us. Do not trust this restaurant and do not bother making a reservation, because you may still be turned away. It really compromised our plans for the evening. We enjoyed a wonderful evening here, the trip advisor reviews were spot on ! 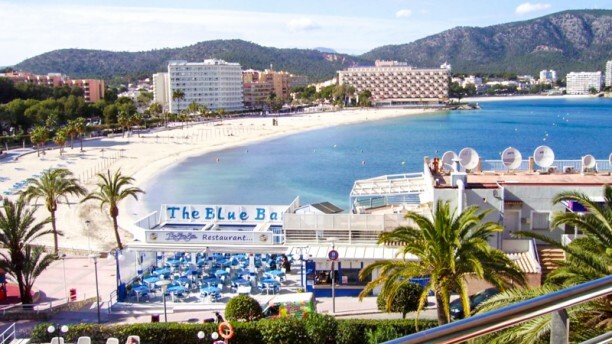 The Blue Bar in Palmanova/Magaluf deserves to be graded Fantastic. Everything from the Aioli with the bread to the exquisite Veal fillet with Pimento sauce has a deep and natural taste. Green salad with tuna,strawberries with cream. Just fantastic. Thank you for an excellent dinner. This restaurant comes highly recommend. Friendly staff, tasty food and great cocktails too. What more could you want !! The service wasn't too great and the fish was raw. Staff didn't seem too bothered although they did take it off the bill. The paella and the starters we had were wonderful. Service was all round decent, but in all honesty when having to deal with tourists constantly I can understand service not being too amazing. Would recommend to anyone visiting. So good we went back again! Beautiful food and setting and great service ???? Loved honey salmon, sangria and staff!